If you are a fan of the whole “Conjuring” and “Annabelle” franchise, this movie will def not disappoint. There are so many origin stories that just plain get it wrong, or try too hard, this one however gets it right on so many different levels. It’s a little more bloody and gruesome than the other movies and is beyond petrifying. You get to learn all about the origins of the hideous creepy doll with good, old school horror, something that you just don’t get a lot of these days. No massive special effects, no over the top CGI…just good old fashion suspense and horror. 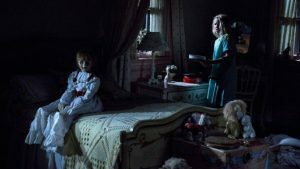 So if you are looking for something to get your heart racing and possibly give you nightmares for a while I highly recommend checking out “Annabelle” this weekend…but you might want to bring an extra set of pants just in case.